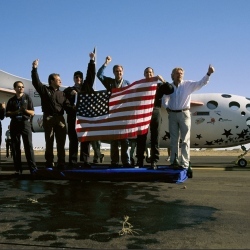 In a pact that clearly aims to create another universal TV moment like the 1969 telecast of Neil Armstrong stepping foot on the surface of the moon, NBCUniversal and entrepreneur Richard Branson’s Virgin Galactic have teamed up to televise one of the earliest commercial attempts to take private passengers into space. During a three-hour live event set to be televised next August on NBC’s “Today” morning show, hosts Matt Lauer and Savannah Guthrie will join viewers in monitoring Branson and his adult children, Holly and Sam, as they travel aboard SpaceShipTwo from Virgin Galactic’s terminal at Spaceport America in New Mexico into space. It is “a huge undertaking,” said Sharon Scott, president and general manager of Peacock Productions, the NBC News unit that helped orchestrate the deal and will supervise production and preparation for it over the next several months. “We were instantly just fascinated by this concept and now have the ability to work with them on ten months leading up to the launch. We can chronicle every milestone, every breakthrough – the first time the ship goes into space, the first time they release who is going to ride in the space ship – and we will deliver it across all of our platforms.